Triple H Fires Shots At All Elite Wrestling During WWE Hall Of Fame Induction Ceremony (Video) - Wrestling Inc. While joking around about being corporate these days, Triple H said apparently these days if you put the "EVP" title in front of someone, it makes them feel important. AEW's Executive Vice Presidents include Cody Rhodes, Kenny Omega and The Young Bucks. 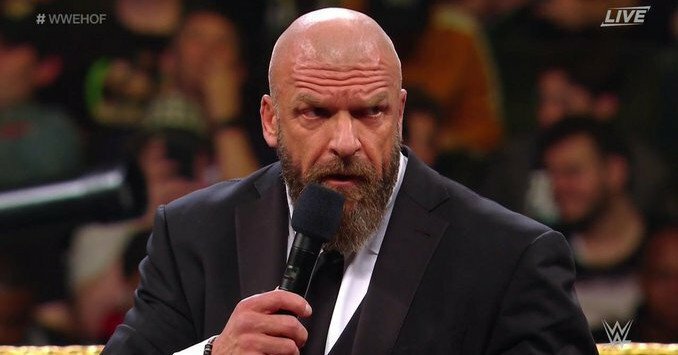 Triple H then called AEW a "piss-ant" company after DX joked around about not being able to name Vince McMahon during their speech. Billy Gunn said Vince couldn't fire him anymore, a reference to Gunn working for AEW. The Gunn joke led to fans in the audience doing an "AEW" chant. Triple H responded, "Billy, let's be honest. He would buy that piss-ant company just to fire you again."